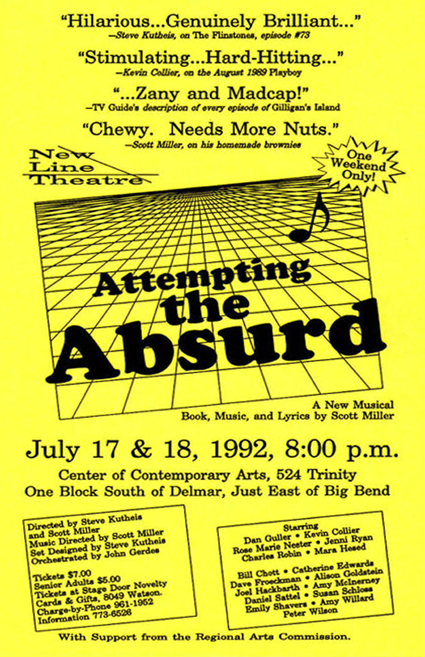 My first experience with New Line was working on Attempting the Absurd in the summer of 1992. 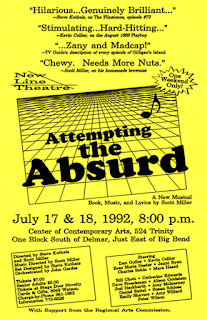 Absurd is a quirky little musical about a guy who knows he’s only a character in a musical (‘I have only a sketchy memory of my past, I feel like everything I do is controlled by someone, somewhere behind a word processor, and I never go to the bathroom.’). I loved playing Jason. He was equally at home in his fictional world as in the real one. He moved through life knowing that someone else was pulling the strings. He was a paradox wrapped in a contradiction wrapped in a bright red shirt. “Right,” I countered, secretly sure that nobody had ever been more wrong than Scott Miller was at this very moment. So I worked on that masochistic list and, lo and behold, one day I noticed I was able to recite it without the script. Not only was the show as much fun for the audience as it was for the performers, but I didn’t flub a single show from that list. Well, here it is, almost ten years later, and guess what? “Oklahoma, The Sound of Music, 42nd Street, South Pacific…” Damn it. Scott was right. Good news for the orangutan. Happy Tenth, New Line! It is the peculiar curse of the American Musical Theatre that it is never realistic. No matter how gritty and real Tony & Maria's Spanish Harlem or Tevye's Anatevka might be, it will never be realistic for them to break from spoken word into song. Bob Fosse solved this problem with the film version of Cabaret by using only the songs performed onstage at the Kit Kat Klub. But by eliminating the other songs, the show really stopped being a musical in the strictest sense. This problem was a constant topic of discussion among the musical theatre crowd at college. There must be a way, we decided, to get around it. And then, senior year, it struck me – if the characters know they're in a musical, then their singing is realistically motivated. They sing because they are characters in a musical. Of course, this then presented lots of new logistical and philosophical problems, problems my roommate David Flores and I argued over for the entire school year. After graduation I set to work, and six years later, my aptly named Attempting the Absurd became a reality, and fittingly, as the second show of my new musical theatre company. Because it’s so much about musical theatre – a parody, a deconstruction, a loving tribute – and because, in an odd way, it’s the ultimate musical comedy, it will always be my favorite of the ten shows I’ve written. It’s not my most sophisticated score or my most artfully built script, but it’s awfully funny and it still makes me giggle. What more can I ask?